Thanks to comments from FED Yellen today USD tanked and Gold & Silver rallied. The "Critical Juncture" I discussed in the prior update (Part IV, 7/24/2017) reacted favorably as you'd probably expect. The gold stock strength today was a complete opposite from what we witnessed 2 days ago -- today the vast majority of gold stocks had green closing indicators today. 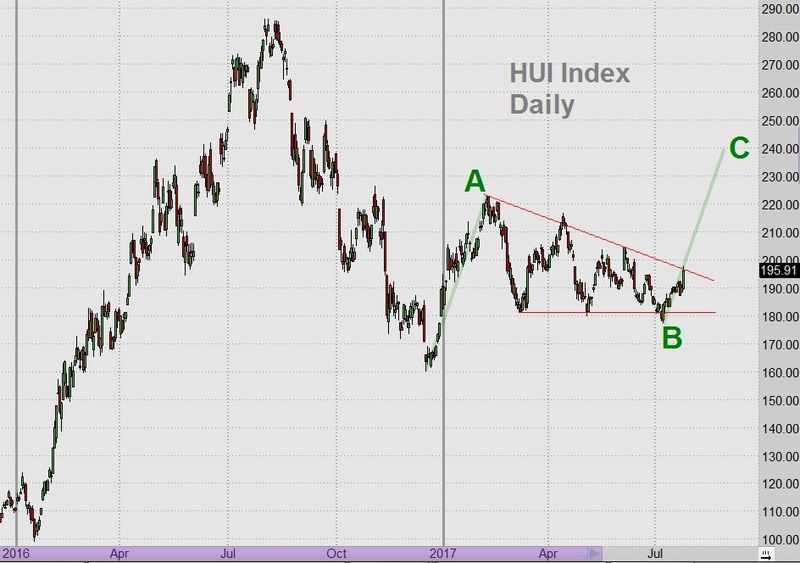 Reviewing the stocks I charted previously: AUY +0.15 (+6.1%), KLDX +0.17 (+5.4%), NGD +0.15 (+5%), SBGL +0,30 (+6.4%), and HUI index +5.81 (+3.1%). See charts & detailed discussion below. Yamana (AUY) 60 minute chart shows that the price tangled with the (red) support line yesterday and again this morning. 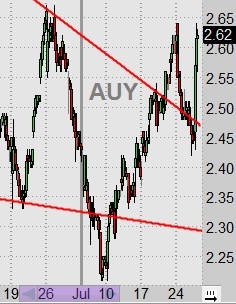 But after Yellen's comments AUY screamed higher where today's high matched Monday's early high at $2.64. Kolondex (KLDX) actually sold below the July 10 low yesterday and got down as far as $3.06 this morning. Today's FED rally was very sharply higher. 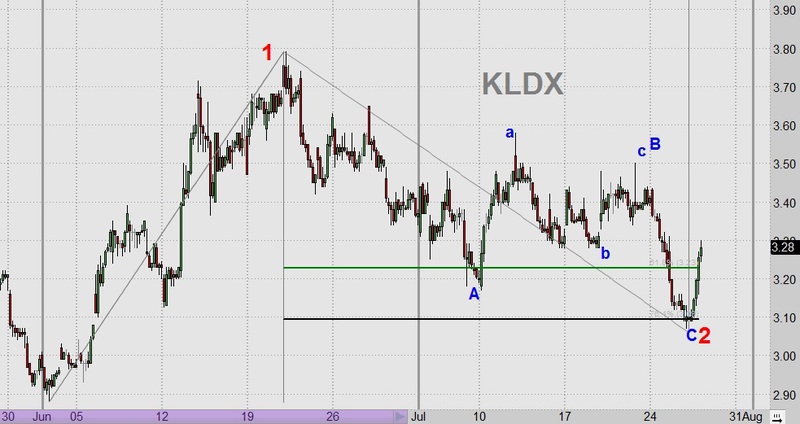 Unfortunately, KLDX is digging itself out of a hole so it is too early to declare whether it is out of the woods and into all out bullish rally mode. As a result of the deeper than expected sell-off to $3.06, I adjusted the EW in the chart above. Favorably, the 60-minute RSI indicator today gave a buy signal at today's low. The new EW implication remains bullish with an initial (red) wave 3 target of $4.54. New Gold (NGD) is back up to the (red) resistance line but it has not yet broken clear of it yet. While this should be a little concerning, the fact that it is right at the line and primed to break higher is a good thing. 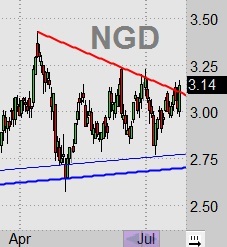 To raise my comfort level with NGD, I'd really like to see it not linger around too long near the (red) line. Once it breaks clear above it, this (red) line will convert to a support line. Of course, being right at the line NGD is vulnerable to being repulsed by it, so monitoring NGD is still essential to determine its likely forward path. Sibanye (SBGL) came down exactly to the converged (red) support line, (blue) secondary support line, and the 62% retracement level yesterday. Today's rally was near vertical right out of the starting bell -- the FED rally only added fuel to it's strong move. Unfortunately from a very short-term perspective, the 60-minute RSI indicator is signaling that this move was too far too fast and some profit taking may occur tomorrow. 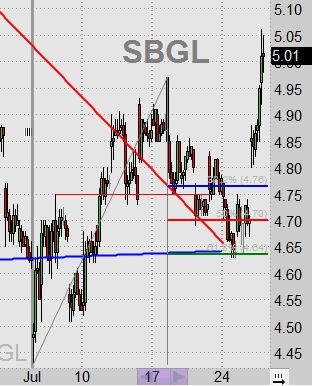 SBGL appears to be back on-track with a bullish outlook -- in fact SBGL seems to be one of the leading gold stocks suggesting a new bull campaign may already be in progress for mining stocks and all it will take is the other gold stocks to catch up and ride along.